Hearing my name called out as a winner at the Victorian Telstra Women in Business Awards was a surreal experience to say the least. To even have been in that room, surrounded by amazing and inspiring women, was an incredible honour. One feeling that really standouts for me from the night was that of overwhelming support. From my friends and family, to all of the other finalists and many other people I had never met before. In the days following there was an influx of congratulatory tweets, texts and emails. That amount of encouragement is a powerful thing. I feel very fortunate to have been so well supported in my career to date, supported by supervisor, colleagues, and mentors. It has made a huge difference to my confidence and self belief, and ultimately what I have been able to achieve. It makes the setbacks less demoralising and the successes feel even better. These experiences have driven me to ‘pay it forward’, and mentoring others has become one of the most rewarding (and enjoyable) things I get to do. Over the last couple of years I have had the experience of being in the position to encourage three of my female academic colleagues to go for promotion. All three were successful in their promotions. It was such a wonderful feeling to see them achieve such well-deserved advancement, to have played even a small role in supporting them to apply felt really good. When we are supportive of each other, when we build each other up, we can all achieve amazing things. And it feels incredible to help someone achieve their goals. To me that is what leadership really is – helping the people around me to achieve, removing roadblocks and providing the support they need. The Telstra Women in Business Awards are a perfect way for us to support and celebrate each other, and ourselves, something we don’t do enough. When we nominate a scientist for these types of awards, or encourage our colleague to go for her promotion or support a mentee to submit her conference abstract, we empower each other. We give each other confidence. If we all continue to pay it forward, we can reach a critical mass. Australian women in STEMM represent an amazing wealth of talent – in their scientific disciplines, as research leaders and science advocates. That talent should be front and centre. I want to utilise the weight of the Telstra Women in Business Awards to do what I can to help women in STEMM increase their profiles, within their own disciplines as well as in science more broadly. I am inspired and eager to ramp up my efforts at promoting women in science and to encourage others to do the same. 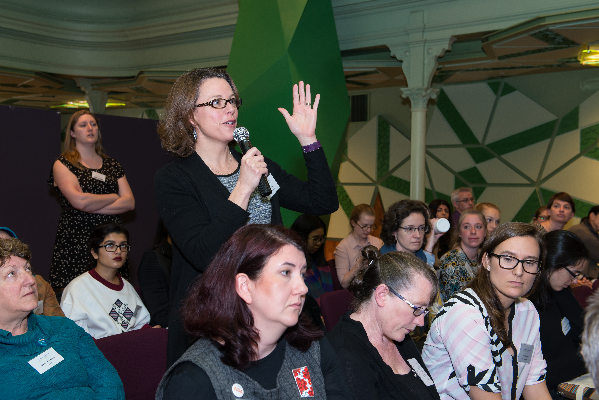 I feel incredibly hopeful for the future, with the Australian based networks that have been developed going from strength to strength – Women in STEMM Australia, Franklin Women to name just two. There are also existing international initiatives that can allow us as individuals to have a greater reach, like the Global STEM Alliance 1000 girls, 1000 futures program which is aimed at encouraging young women to pursue careers in science. In this program I have been fortunate to have spent some time mentoring high school students from Saudi Arabia and Beijing, sharing with them my experiences as a scientist. It is true that ‘you can’t be what you can’t see’ or it least it’s a lot harder to pursue a career or a passion without relatable role models. I didn’t have any visible female role models in science growing up, it was not a career I considered until about midway through undergraduate degree. Recently my nine year old niece has started to say that she wants to be a ‘brain scientist like Auntie Katie’. And whether she ends up pursuing science or not, the fact that she wants to at age nine gives me a lot of faith in the power of visible role models. So let’s make more! Start with nominating that inspiring woman colleague for an award. Associate Professor Kate Hoy is an NHMRC Fellow and Clinical Neuropsychologist at MAPrc where she is Deputy Director of the Therapeutic Brain Stimulation division and Heads the Cognitive Therapeutics Research Program. Kate’s research is focused on the development of novel biological treatments for cognitive impairment in both psychiatric and neurological illnesses. Specifically, her group investigates the effects of brain stimulation techniques. She is currently conducting clinical trials aimed at improving cognition in patients with schizophrenia and Alzheimer’s, as well as in healthy older adults. Kate’s team is also conducting research looking at cognitive impairment in head injury and mild cognitive impairment, as well as investigating ways in which to optimise efficacy of prefrontal brain stimulation techniques. Kate has worked in brain stimulation research for more than 13 years and is a leader in the field. She has more than 80 publications and received over $3.5 million in competitive funding. In 2014 she was awarded the NHMRC Excellence Award for the top ranked Career Development Fellowship – Biomedical Level 1, and recently won the 2017 Victoria Telstra Business Women’s : Public sector and Academic Award. Kate is currently a member of the Faculty of Medicine Research Committee, a past member of the Monash ECR network, was the inaugral ECR representative on the Monash Research Committee, and is a former Deputy Chair of the Australian Academy of Science EMCR Forum, an advocacy group for early to mid-career researchers. She is also currently a mentor in the Global STEM Alliance 1000 girls, 1000 futures program. Kate also initiated, and maintains, the women in brainstim database site aimed at addressing the extreme gender imbalances at international brain stimulation conferences. Go to womeninbrainstim.com to find out more and register. Kate is passionate about communicating science to the public, not only her own research, but the importance and impact of science in general. She gives regular talks on her research to a range of audiences, she is active on twitter, has published articles in consumer targeted magazines (i.e. Link Disability Magazine, Australian Quarterly) and The Conversation, and has been interviewed in the media on a number of occasions. Kate was awarded a 2013 Victorian Tall Poppy Science Award in recognition of both her research excellence and commitment to science communication. An amazing Women, Kate Hoy. May Kate go from strength to strength and continue to provide the role model she does so humanely and generously. And may support be there, from many directions, to help her achieve this amazing journey. Every family will receive valuable knowledge, and a brighter future, which may not have been possible without women of commitment and passion like Kate Hoy.